A large genus with over 400 species Corydalis plants enjoy a range of conditions from sun to deep shade, depending on the species. With wonderful spurred flowers from spring to autumn. The flowers range from blue through to yellow and red. With attractive ferny foliage Corydalis looks great as a specimen or when used as a ground cover plants. Most Corydalis like damp conditions, and part shade, think woodland situation, so a well drained soil with plenty of compost or humus dug in to it will suit. They can be grown in pots or containers where a mass planting will look wonderful in spring with the masses of flowers. Propagation is from seed or by dividing established clumps in late winter. 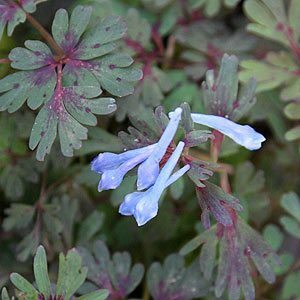 C. flexuosa is the popular blue form, with a purple leafed form also available, Corydalis elata is also a blue flowering plant, while Corydalis lutea is a yellow flowering plant. The rhizome of C. ambigua (common name, Corydalis Yan Hu Suo) is used in Chinese medicine. C. ochroleuca is a white flowering species, and all are clump forming perennials.